Chuck Brennan surprised a ball park full of little league baseball players and their parents when he announced he would more than double his $10,000 donation. 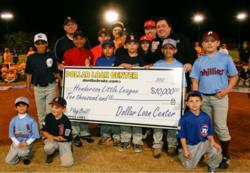 Dollar Loan Center CEO Chuck Brennan surprised a ball park full of little league baseball players and their parents at this year’s Henderson Little League Kick Off Celebration when he announced the company will more than double its $10,000 donation from 2011 to keep the league running. After hearing how many sponsors had pulled out of their commitments this year, Brennan increased his donation to $25,000 to commemorate the league’s 25th anniversary in 2012. This year’s donation makes Dollar Loan Center the largest single contributor to Henderson Little League for the second year in a row. In 2011, the league was in danger of shutting down due to lack of funding from its previously regular sponsors. Brennan stepped in with a $10,000 donation that allowed the league to fund its entire season of games and tournaments. At the 2012 season opener, Brennan had planned to commit another $10,000 until he heard that even more league sponsors had pulled their funding. Standing on the pitcher’s mound at Morrell Park in front of nearly a thousand Little League families, Brennan decided to do even more. Brennan’s generosity continued beyond his sponsorship of Henderson Little League’s 2012 season. He donated $500 to the opening night’s 50/50 fundraiser raffle, doubling the prize for one lucky family. And in a spontaneous act of compassion, he committed $5,000 to a Little League family whose child is battling cancer. The family’s son, Cody Clark, grew up playing baseball with Henderson Little League. Clark, 20, took the stage to thank the Henderson Little League for dedicating the 2012 season to him and his family. He was diagnosed with cancer in his hip bone in January of 2012 and is currently undergoing chemotherapy treatments to help reduce the football sized growth. Clark played Little League in Henderson from the time he was five years old until he was 15, according to Ream. Brennan is one of Nevada’s most recognized philanthropists, giving more than $500,000 annually to charities across the country. In 2011 alone, he supported Opportunity Village in several campaigns, the 15 Foundation, Henderson Little League, Boys and Girls Club, the Alice Cooper Solid Rock Foundation and dozens of other deserving organizations. Brennan owns and operates 50 Dollar Loan Center locations throughout Southern Nevada, South Dakota, and Utah. The philanthropic stores maintain a continuous stream of generous giving by supporting a collection of established children based charities. In 2007, Entrepreneur Magazine listed the company among its “Hot 500” Fastest Growing Businesses and Entrepreneurs.” For more information, visit http://www.dontbebroke.com.